Auditions are being held for the 2018-2019 season of Noteworthy. All students enrolled in high school choir for next year are eligible to audition. See Mr. Beck to schedule an audition time. Students who participated in the Music Technology STEM module need to see Mrs. Meller to let her know if you are planning to attend the final session at Above Pete’s Garage next week on Thursday, May 17th. This is important so we can plan transportation. Please make sure you talk to Mrs. Meller by the end of the day tomorrow. Thank you so much for coming to the 2nd grade consumer fair. It was extremely successful. Thanks to all of you! Final totals will be shared on Monday. Attention Spanish Club: Cinco de Mayo meal begins at 7pm this evening with the show at 8:00. Please sign in on the attendance sheet in the cafeteria near the water cooler when you arrive. Props and costumes should be set up in the band room. Activity Period today will be for FFA & Student Council. FFA will meet in Mr. Poulson’s room and Student Council will meet in the theater. All other students should report to homeroom. Spanish II musicians and dancers need to meet in the theater during activity period today. If you are a contestant or in the sound booth for Pettisville Idol, you need to stop by Mrs. Bacon’s room and sign up for your t-shirt size. Find your name on the sign-up sheet and write your size. Please complete this today because the t-shirt order will be placed after school today. Come one come all to the 2nd grade Consumer Fair in the atrium! It is today from 12:45-2:15. There are many interesting items for you to check out. Proceeds go to the Brian’s Miracle Fund. Hope to see you there! Attention all students who have participated in any of this year’s STEM modules. Please meet in the atrium for a group picture after school today. This is for all STEM modules, not just the current one. 7th graders and NHS members: Please plan to meet for literary lunch bunch today at lunch. If you are a contestant or in the sound booth for Pettisville Idol, you need to stop by Mrs. Bacon’s room and sign up for your t-shirt size. Find your name on the sign-up sheet and write your size. Please complete this by Friday because the t-shirt order will be placed after school on Friday. Attention all students who have participated in any of this year’s STEM modules: Please meet in the atrium for a group picture this Thursday after school. This is for all STEM modules, not just the current one. The Consumer Fair is tomorrow. Many of you have been involved in past years. Come and check out the many creative items that have been made by the second graders. Come buy a gift for your mom, yourself, or a friend. See you all there! Archbold Memorial Park will be hosting a dodgeball tournament on Saturday, June 16. Please see the bulletin board by the cafeteria for more information. Congratulations to the baseball team for their sectional semi-final victory over Fayette last night by a score of 14-2. The baseball team will travel to Hicksville on Thursday for the sectional final beginning at 5:00. Congratulations to the boys’ and girls’ high school track teams for placing first out of four teams in the track meet yesterday. 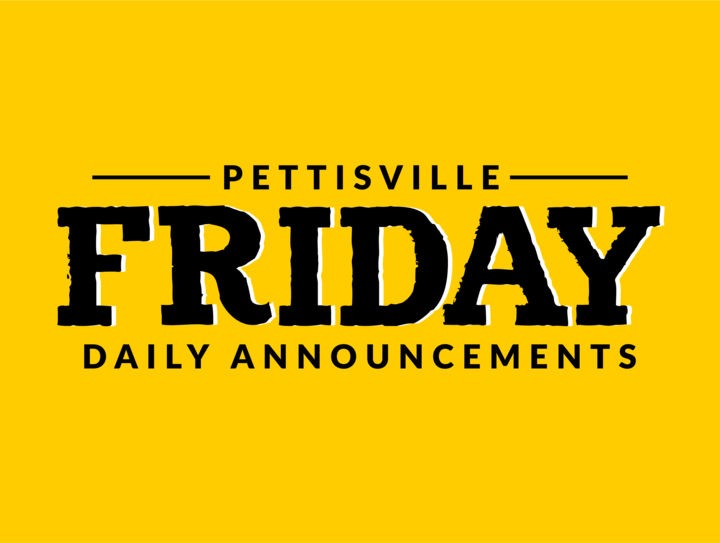 Pettisville girls beat out N.C. by 64 points and the boys finished first with a 15 point lead. We will be taking a group picture of the high school quiz team members today during lunch. Please wear your quiz shirt. The 2nd grade Consumer Fair is only 2 days away. Come check out the products that Pettisville’s creative second graders have made. Mother’s Day is just around the corner. Who knows….there may be a gift just right for your mom! Hope to see you at the Consumer Fair. STEM Club will meet after school in the atrium today to travel to a managed forest setting. Please make sure to bring old shoes or muck boots to wear. It will be wet and muddy. See Mrs. Miller or Mrs. Meller if you have questions. Students who participated in the music production STEM module need to touch base with Mrs. Miller or Mrs. Meller about going to Pete’s Garage next week. We need to find out who is going and who needs transportation. Congratulations to the softball team for their 6-5 sectional semi-final victory over Fayette last night. The softball team will travel to Tinora on Thursday for the sectional final starting at 5:00pm. Good luck to the baseball team today as they host Fayette in the sectional semi-final at the Pettisville varsity baseball field starting at 5:00. This is an OHSAA tournament event. Ticket prices are $6 for adults and $4 for students. Due to voting at the park pavilion today, track team members that drive to the track are asked to park in the grass area by the first base dugout at the baseball field and then walk to the track. We will be taking a group picture of the high school quiz team members on Tuesday this week during lunch. Please wear your quiz shirt. The 2nd grade Consumer Fair is Thursday. We have all kinds of items to buy. We will have a variety of items to choose from: bookmarks to marshmallow shooters. Come check out what the 2nd graders have made. Proceeds are going to Brian’s Miracle Fund. There will be basketball open gym tonight from 7:00-8:30 for girls in grades 6-11. The girls’ track team were the Invitational champions this past Saturday at Montpelier. The boys’ team placed 12th. At the FFA Convention over this past weekend, many of our students deserve congratulations due to receiving special honors in different categories. Also, Gretchen Lee was elected to the position of Ohio FFA Association State Secretary. Congratulations to all involved and to Mr. Poulson for the time and dedication he puts into our FFA!